We’ve been so frustrated here because of all of the water on site. 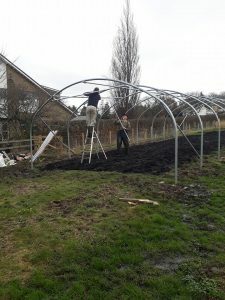 Snow melt and constant downpour had brought our groundwork to a standstill for such a long time, but battling through the mud we have managed to get the poly tunnel frame up and it’s looking impressively like it might even stay up! 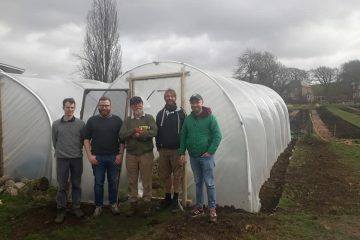 We have had a few volunteers on site, planting, digging and mulching too. Get in touch with us if you would like to become part of the volunteering team there’s still so much to do.